Attaches externally-referenced drawings to the current drawing, through a dialog box (short for "external attach"). Note: This command is a shortcut to using the -XRef command's Attach option. If you choose Specify On-screen, then you are prompted in the command line for the insertion point, scale, and/or rotation angle. The XDWGFADECTL system variable controls the fading level for Xref inserts. Non positive values disable fading. Values between -90 and 90 are accepted. Choosing another name lets you modify that xref's properties. 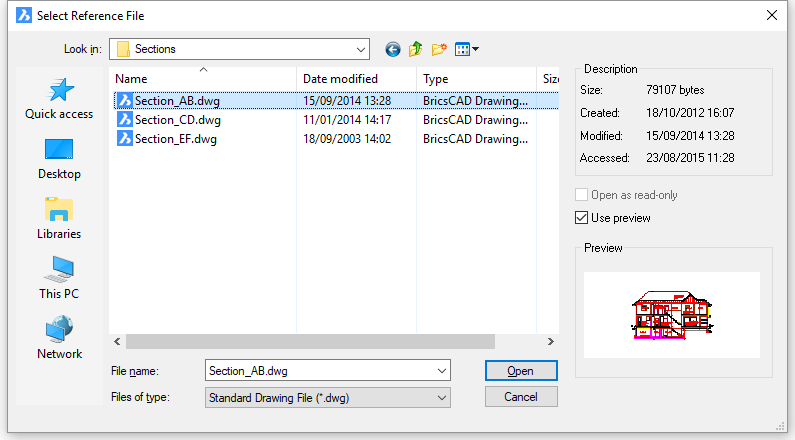 Reports the path that will be remembered by BricsCAD. You cannot edit this field; instead, use the Browse button to modify the path to the file. Relative path - stores the relative route to the xref'ed DWF file's folder, such as ..\filename.dwg (..\ means one folder higher). This option does not work until the drawing has been saved at least once. X, Y, or Z - specifies the x, y, and/or z coordinates for the xref's insertion point. Use 0,0,0 to insert the xref at the drawing's origin. Corner/XYZ/X scale factor - enter an option, pick two points a number, or press Enter for the default value. X, Y, or Z - specifies the x, y, and/or z scale factors of the xref in the x, y, and z directions. Use 1,1,1 to keep the xref at its original size. Rotation angle for block - enter a number, pick two points, or press Enter for the default value. 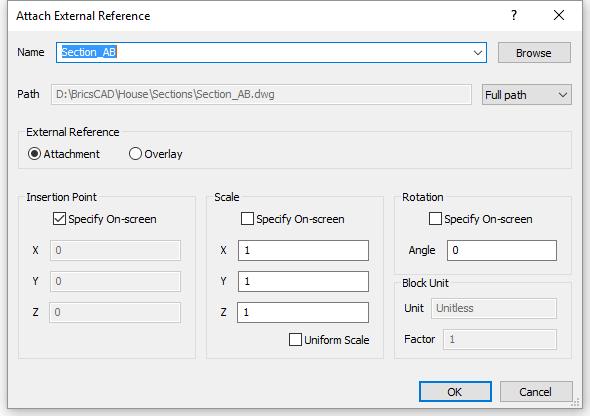 Off - specify the angle in the dialog box using the Angle field. Unit - reports the INSUNITS setting of the drawing being attached. Factor - reports the calculated scaling factor with respect to the INSUNITS setting of the drawing being attached and the current drawing. Attaches the DWG file to the current drawing. PlaceView - places a model view selected from a source drawing into a paper space layout of the current drawing.